LED lamp with battery and 5 hours of autonomy. 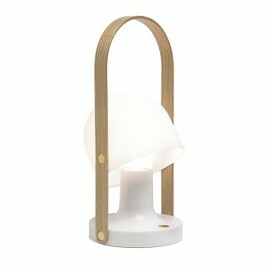 Overhead diffuser, finish: Matt white and wooden handle. 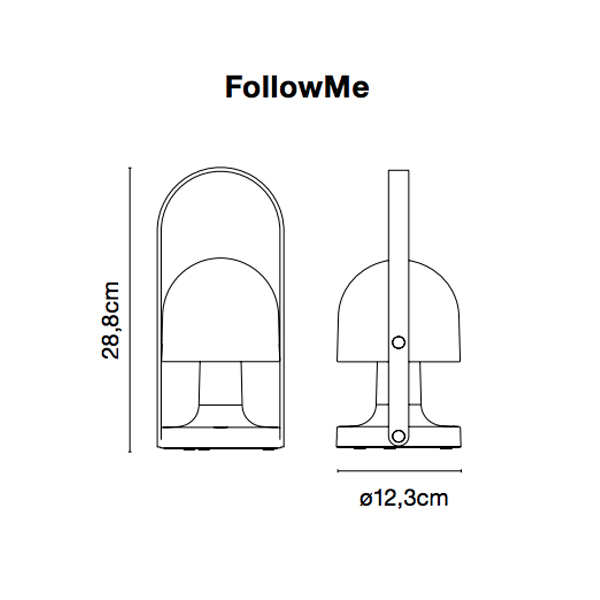 Portable and rechargeable, FollowMe is a table lamp to place anywhere. Due to its autonomous character, small format and warmth is suitable both indoor housing and outdoor. Also in restaurants and terraces that have no access to plug, or as a substitute for the light of candle. Oak handle invites you to pick it up. Compact and of reduced dimensions, it seems almost a personal accessory. With tilting screen of white polycarbonate, emphasizes its fresh bright profile. It includes LED technology, with regulatory intensity dimmer. The battery is built-in and has USB input for recharge. Rocker opal diffuser and polycarbonate body white matte, which is inside a battery with 5 hours of autonomy at full capacity. Plywood in natural oak handle. Constructive and switch details in brass.